ringgit.me: Dude, what's wrong with my country? WTF is wrong with my country?! I don't remember having the word "Haze" in my vocabulary as far back as 10 years ago. In the span of 10 years, I have learned words like tsunami, El Nino and Haze. All these weather phenomenom did not appear until the last 10 years. What is wrong with the world? Can anyone imagining breathing in those smog everyday? Can you imagine breathing in ash? 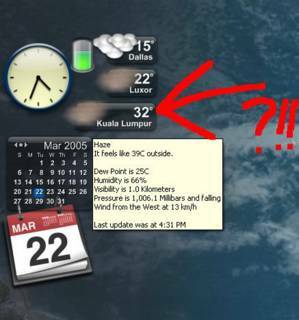 Can you imagine a tropical country like Malaysia having visibility of just 1km?? ONE Kilometer! The funny part is, as I walked out of my building, the first thing I see is 10 people (men and women alike) standing outside puffing cigarettes, with the haze as their backdrop. I wish I have a camera to capture the irony of it all. So, the question is, do you see the world your children is inheriting from you? Gives me the jitters just thinking about it. Brrr..
Update: Half an hour later, at 5pm, Kuala Lumpur is still hazy and Luxor is Sunny with a temperature of 25 degree.